The figure used for this unit is a Star Wars figure from the Alliance & Empire set. Its model number and name are #31/Scout Trooper. The figure used for this unit is a Star Wars figure from the Imperial Entanglements set. Its model number and name are #19/Scout Trooper. Character Bio - Scout troopers were specially trained soldiers of the Imperial Stormtrooper Corps. As light-armored variants of the Imperial stormtroopers, scout troopers were specifically trained for specialized missions and were skilled in the use of speeder bikes. As such, they were exceptional additions to the Imperial military as reconnaissance troops, spies and survivalists. They were excellent marksmen, and thus they were regarded as the finest snipers in service to the Galactic Empire. They were most notably seen in action on the forest moon of Endor, protecting the shield generator for the second Death Star. As soldiers, the Scout Troopers may benefit from Marcus Decimus Gallus’ SOLDIER ATTACK ENHANCEMENT attack bonus. As soldiers, the Scout Troopers can benefit from Marcus Decimus Gallus’ SOLDIER LEADERSHIP movement bonus. 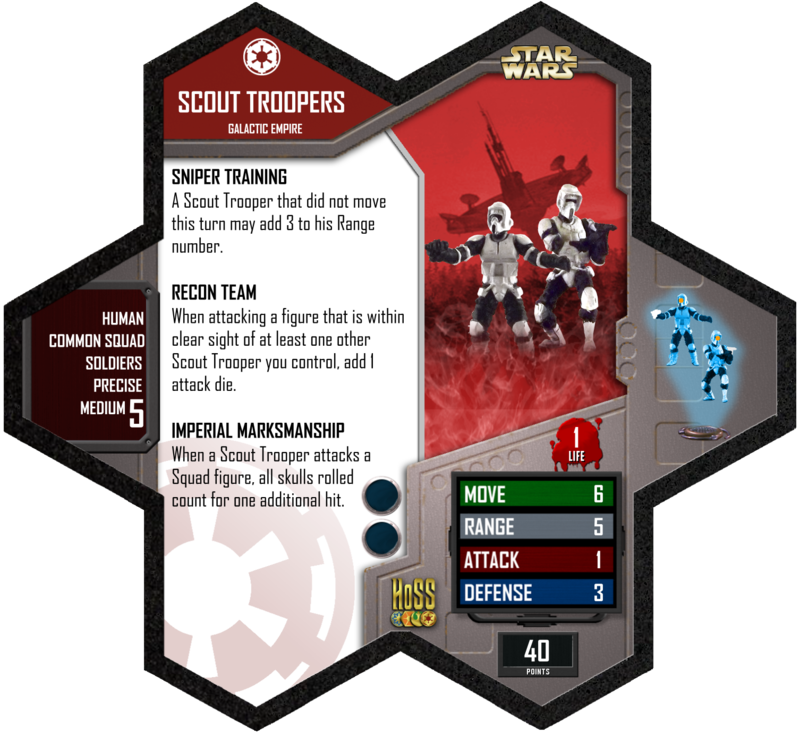 Being a Common Squad that follows the Galactic Empire, the Scout Troopers may benefit from General Veer's GROUND TACTICS EXPERT special power. Being Common figures with a range of four or more that follow the Galactic Empire, the Scout Troopers may benefit from an Imperial Officer's IMPERIAL COMMAND special power. Being figures that follows the Galactic Empire, the Scout Troopers may benefit from Grand Moff Tarkin's IMPERIAL DEPLOYMENT special power. 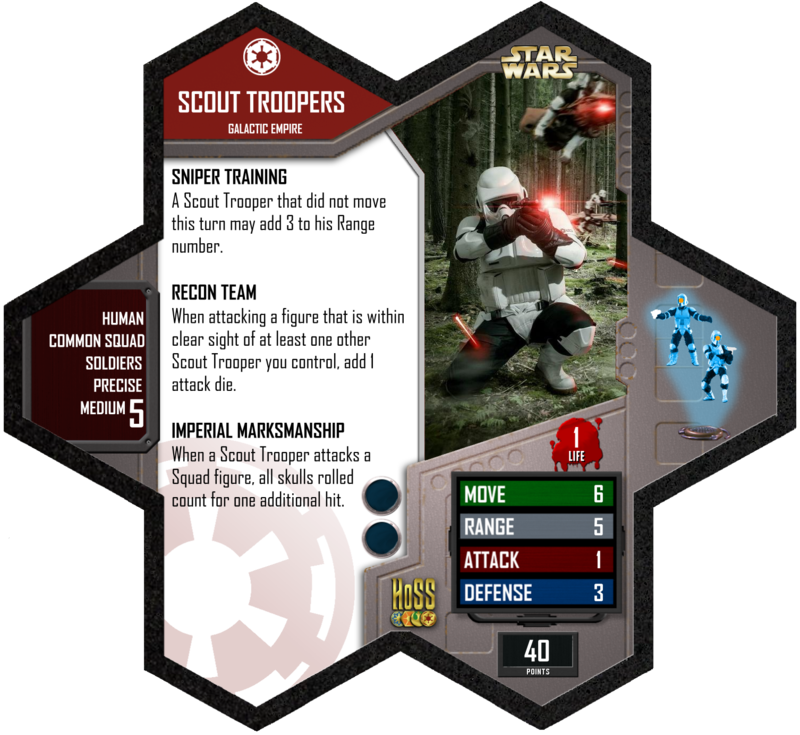 Being a Common Squad that follows the Galactic Empire, the Scout Troopers may benefit from Admiral Ozzel's SURPRISE ATTACK special power. Being a Common Squad that follows the Galactic Empire, the Scout Troopers may benefit from an Imperial Officer's WE'RE SENDING A SQUAD UP special power. Being Human squad figures, the Scout Troopers may aid the E-Web Trooper with his E-WEB SPECIAL ATTACK. Last edited by Porkins; October 2nd, 2017 at 05:19 PM. A Scout Trooper that did not move this turn may add 3 to his Range number. When attacking a figure that is within clear sight of at least one other Scout Trooper you control, add 1 attack die. When a Scout Trooper attacks a Squad figure, all skulls rolled count for one additional hit.